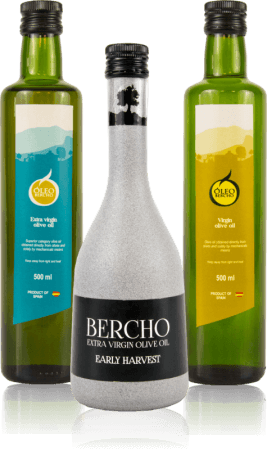 Early harvest olive oil from the best Bercho´s olive trees. An unique and special gourmet oil, maximun exponent of our manufacture. Gourmet oil of early harvest collected from the best olive trees of Bercho An unrivaled and special gourmet, maximum exponent of our manufacture Of intense flavour, with green color and fruity smell. Without chemical additives, only through mechanical procedures. Use a variety of Picual olive. A olive oil of early harvest is obtained from olives even green, before this olives achieve their higher ripening stage, during the first days of harvest in the months of October and November. These early olives resulting in a olive oil with an unrivalled flavour and smell. Olive oil with an intense flavour to consume raw. This olive oil is known as the highest quality olive oil made from olives of early harvest. The olive oil of early harvest is used without cooking to give an extra flavor to foods such as cheese, bread or ham. It is also the best if you want to dress a salad.